Due to the low water levels around the Lower Murray Lakes several Government agencies have required the use of special craft and vehicles to access areas for geo surveys. 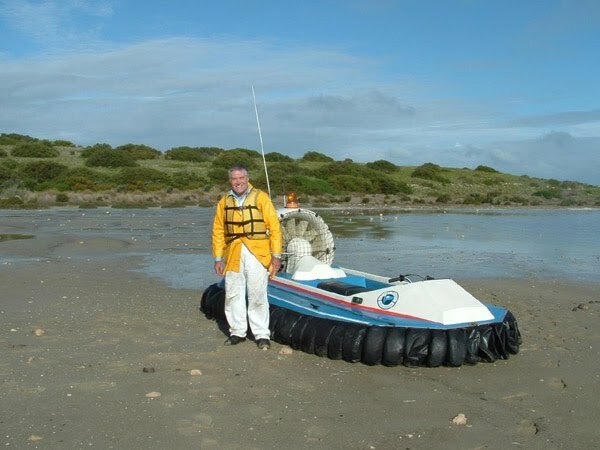 The use of the hovercraft was arranged from the beginning of March 2009 by SA Water and then EPA staff to check acid soils and water quality in shallow areas and muddy ground around Clayton, Barrages and local feeder rivers. A full comprehensive study was then carried out by CSIRO scientists on Lake Albert and Alexandrina to gain more samples of sulphate deposits creating acidic conditions with low water. Over 500 kilometers were flown in two weeks. This was the most extensive use of a hovercraft for survey in the states history. The craft carried survival gear and emergency equipment to ensure repairs to the craft in remote and dangerously muddy areas where the only access is by another craft. The speed at which the sample sites could be accessed and tests carried out greatly increased the sample rates to hasten the decision making process on remedial action urgently required. Photos from around the Clayton area and Mulgundawa top north east corner of Alexandria show cracked drying mud in which the hovercraft had to stop due to loss of air cushion through the cracks. If the cracks became widespread the use of the hovercraft would be restricted. The large area of acidic water in the Loveday Bay section described in the DEH release was found using the hovercraft survey. The hovercraft was charted from Hoverservices, which is also used by Police and SA Sea Rescue as a sole resource for rescues in shallows and mangrove mud coastlines. The craft was on standby at all times for emergency operations during the survey work on the Lakes Project.